1As for the one who is weak in faith, welcome him, but not to quarrel over opinions.2One person believes he may eat anything, while the weak person eats only vegetables. 3Let not the one who eats despise the one who abstains, and let not the one who abstains pass judgment on the one who eats, for God has welcomed him. 4Who are you to pass judgment on the servant of another? It is before his own master that he stands or falls. And he will be upheld, for the Lord is able to make him stand. (4) Rom 14: 1 We should welcome those Who Are Weak in faith From Wallowing in Works. 1 Rom 14: 1 address believers, those in the faith. Believers faith (system of belief in Christ) can be weak (morally, feeble and unhealthy/sick). Faith is the system of things we believe about Christ, which makes us His disciples. What is of faith pertains to a gift from God, and never something that can be produced by people. In short, 4102/pistis (“faith”) for the believer is “God’s divine persuasion” – and therefore distinct from human belief (confidence), yet it engages us to produce within us confidence in what God gives. The Lord continuously births faith in the yielded believer so they can know what He prefers (discriminates, chooses and regards as His will for them). Mature faith is explained in 1 John 5:4 — (ESV) For everyone who has been born of God overcomes (conquers, is victorious, prevails against, subdues and is free from the power of) the world. And this is the victory that has overcome the world—our faith. Weak faith is engaged in stumbling over and being tripped up by the things in the world, as if whether or not we touch or are near them, or brush against them is evidence of our spirituality. Notice the more “rules” you want to make for yourself and others that do not impact how our salvation is rooted in Christ, the weaker you are. we want to balance being sensitive to people’s weaknesses, but not necessarily being controlled or manipulate by their version of Christian rule keeping. Whether we 2Eat or Don’t Eat certain things, becomes a source of pride in our accomplishments. This includes whether or not one wants to be a vegan or a vegetarian. Neither is a matter of Bible doctrine, but of one’s personal preferences, which could or may not be based in Scripture. Jas 4;6 & 1Pet 5:5 God resists the proud, but gives grace to the humble. Prov 16:8 “Pride goes before destruction, and a haughty spirit before a fall.” No one keeps all their own human-made rules perfectly. So if we are works or performance oriented we tend to make needless ungodly comparisons of ourselves with others. (1 Cor 2:10-14 10these things God has revealed to us through the Spirit. For the Spirit searches everything, even the depths of God. 11For who knows a person’s thoughts except the spirit of that person, which is in him? So also no one comprehends the thoughts of God except the Spirit of God. 12Now we have received not the spirit of the world, but the Spirit who is from God, that we might understand the things freely given us by God. 13And we impart this in words not taught by human wisdom but taught by the Spirit, interpreting spiritual truths to those who are spiritual 14The natural person does not accept the things of the Spirit of God, for they are folly to him, and he is not able to understand them because they are spiritually discerned. 15The spiritual person judges all things, but is himself to be judged by no one. 16“For who has understood the mind of the Lord so as to instruct him?” But we have the mind of Christ. Know The Difference Between A Doctrinal Command vs. A Personal Conviction Thus verses Rom 14:2-3 says it doesn’t matter so much what your convictions are because they don’t affect salvation, so it shouldn’t matter to you. A Doctrinal commandment is a prescribed obligation, statute and ordinance, and/or a prescribed way of behaving. A Personal conviction is what 5One person esteems or considers or regards as prized; highly valued to regard with reverence and respect, based their own intelligent comparison and contrast from assessing God’s word to determine what is right and wrong for them. The challenge with convictions is that they can change. as we develop and mature. the day one should worship, as one person esteems one day as better than another, while another esteems all days alike. Leviticus 18:5 — Keep My statutes and My judgments, for the man who does these things will live by them. I am the LORD. Deuteronomy 1:3 — In the fortieth year, on the first day of the eleventh month, Moses proclaimed to the Israelites everything that the LORD had commanded him concerning them. Treasury of Scripture — Now therefore listen, O Israel, to the statutes and to the judgments, which I teach you, for to do them, that you may live, and go in and possess the land which the LORD God of your fathers gives you. Deuteronomy 5:1 — And Moses called all Israel, and said unto them, Hear, O Israel, the statutes and judgments which I speak in your ears this day, that ye may learn them, and keep, and do them. Romans 10:5 — For Moses described the righteousness which is of the law, That the man which doeth those things shall live by them. 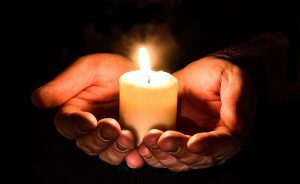 Jude 1:3-4 3Beloved, although I was very eager to write to you about our common salvation, I found it necessary (needful, unavoidable) to write appealing to you to contend for the faith that was once for all delivered to the saints. 4For certain people have crept in unnoticed who long ago were designated for this condemnation, ungodly people, who pervert the grace of our God into sensuality and deny our only Master and Lord, Jesus Christ. Exodus 18:20 — Teach them the statutes and laws, and show them the way to live and the work they must do. Deuteronomy 4:2 – Do not add to what I command you and do not subtract from it, but keep the commands of the LORD your God that I give you. Deuteronomy 5:33 — You must walk in all the ways that the LORD your God has commanded you, so that you may live and prosper and prolong your days in the land you will possess. Deuteronomy 8:1 — You must carefully follow every command I am giving you today, so that you may live and multiply, and enter and possess the land the LORD swore to your fathers. Deuteronomy 30:16 — For I am commanding you today to love the LORD your God, to walk in His ways, and to keep His commandments, statutes, and ordinances, so that you may live and increase, and the LORD your God may bless you in the land you are entering to possess. Leviticus 18:5 — Ye shall therefore keep my statutes, and my judgments: which if a man do, he shall live in them: I am the LORD. Psalm 105:45 — that they might keep His statutes and observe His laws. Hallelujah! choices should be informed by conscience. Choices include style preferences that suit our personality. Rom 14:5b Each one should be fully convinced in his own mind. This insinuates we should not be trying to force people to agree with our convictions and choices. 2 Timothy 2:14 – NLT Remind everyone about these things, and command them in God’s presence to stop fighting (quarreling/wrangling/stive) over WORDS (to be disputatious on trifles — strive about words). Such arguments are useless, and they can ruin those who hear them. 5One person esteems (considers, regards, makes what for them is an intelligent comparison and contrast based on God’s word) one day as better than another, while another esteems all days alike. 1 Timothy 6:12 (NLT) —Fight the good fight (contest, a struggle in the soul) for the true faith. hold tightly (to take or seize, sometimes with beneficent and sometimes with hostile intent) to the eternal life to which God has called you, which you have confessed so well before many witnesses. 1 Timothy 1:18 NLT — Timothy, my son, here are my instructions for you, based on the prophetic words spoken about you earlier. May they help you fight well in the Lord’s battles (a campaign, expedition, military service of Christian warfare). 1 Tim 1: 18-20 18This charge I entrust to you, Timothy, my child, in accordance with the prophecies previously made about you, that by them you may wage the good warfare, 19holding faith and a good conscience. By rejecting this, some have made shipwreck of their faith, 20among whom are Hymenaeus and Alexander, whom I have handed over to Satan that they may learn not to blaspheme. 9For to this end Christ died and lived again, that he might be lord (ruling authority and owner with full dominion and lordship over this jurisdiction) both of the dead and of the living. (13) Geese Get It Right! 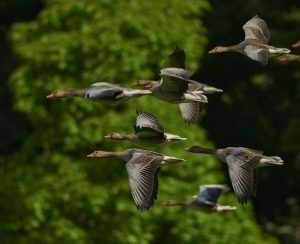 By working together each goose flies 71% farther! So the effect of the coordination is plus 1.71 x the number of geese in the flock. The lead goose is the “windbreaker.” When fatigued he/she drops to the rear where the lift of the other birds makes flying much easier. The geese honk to encourage each other, especially the wind breaker. If one is injured, two drop down with it, to protect and nurture it. Once able to fly they work together to catch up with the flock. Respect their views and how they process information, and what influences their choices. Reconcile when we fail to meet all of each other’s expectations. (15) Let’s Pray that God ReAwakens, ReInvigorates & ReEstablish Us in Our Calls In Christ! Matt 22:37 And he said to him, “You shall love the Lord your God with all your heart and with all your soul and with all your mind.